The weather in Chicago has been crisp and cool and sometimes rainy. The leaves are changing color and we’ve started to curl up under our comforters. We are also – HORROR! – wearing socks again. It’s definitely the type of weather that makes me crave warm comfort food. Do you know what’s more comforting than comfort food? Good friends! And good friends share awesome vegan recipes with their vegan friends. Today’s recipe was graciously shared with me by Monika, my good friend and colleague. Tomato soup is definitely a great comfort food and a great way to use up those summer tomatoes that are still lingering in your kitchen! Clean the tomatoes and remove the stem. Place in an oven safe dish and pour boiling water over the tomatoes. Keep the tomatoes in the dish for approximately 30-60 seconds. Remove from the dish and peel the skin. Cut the tomatoes in half and set aside. Turn on the oven to 350F as you prepare the baking sheet. Place the tomato halves on the sheet. Sprinkle tomatoes with salt, pepper, sugar, balsamic vinegar and olive oil. Bake in the oven for 30-60 mins or until completely soft. Melt olive oil in a large saucepan over medium-low heat. Add onion, carrots, garlic, and basil. Cook, stirring, until golden brown, set aside. Mix the stock, set aside. Remove the tomatoes from the oven, set aside to cool and bring out the food processor/blender. In a large bowl add: roasted tomatoes, onion/carrots/garlic/basil and process with blender. Add stock, and process again. 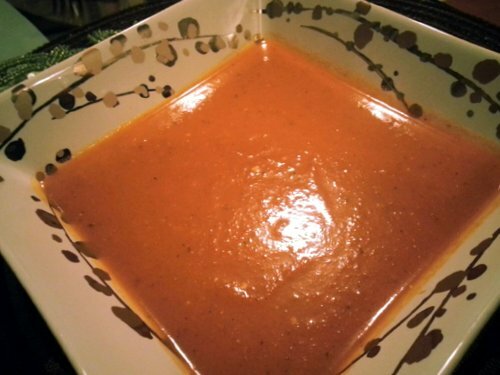 Pour the soup into a saucepan and cook over medium-low heat for 15-20 mins. Add salt, pepper as desired. If soup tastes too sweet add a splash of vinegar or lemon. The more time the soup is “cooked/warmed up” the better it will taste. The soup was even more tasty the next day!